My hometown Sendai, Tohoku(northeastern) region, Japan. I take pictures to keep my favorite places in my mind. After our visit in Utatsu, we also visited in Shizugawa, Minamisanriku Town, 90km northeast from Sendai City, my friend's hometown. There were many prayers by the Minamisanriku Town Hall. 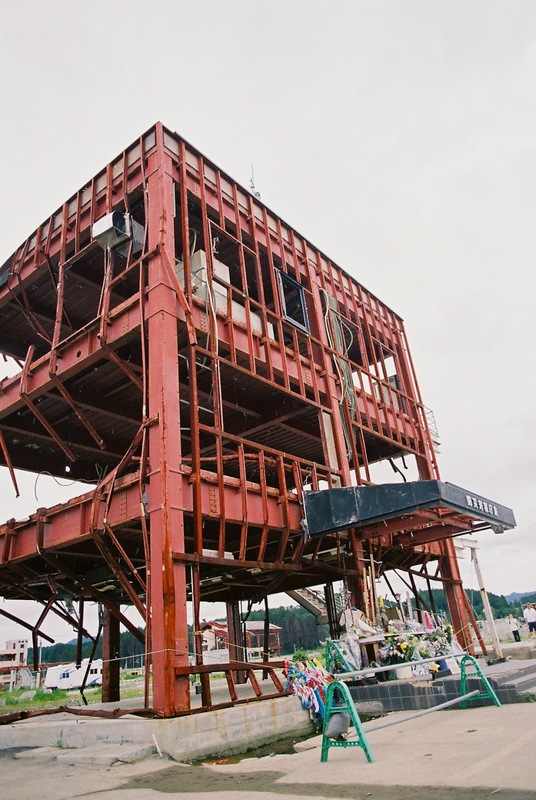 Tsunami hit this building and only the framework is left. But this building will be pulled down soon because it makes people in this town remember the memory of the tsunami. Around Shizugawa Hospital, landscape of ruins of the houses with weeds. I heard that the person who was shutting them was also washed away. There used to be a big park near the water gates but now it became heaps of debris. SL which was on display in the park before is now a part of them. The shopping mall and Shizugawa Hospital will also be pulled down soon. The community hall 1 year and 3 months after the disaster. Just a short stay in Shizugawa but I felt many things. Time passes and the scenary of Shizugawa is now disappearing. Although some buildings are left as it was in March last year. Many people wants to group like "We're all same Japanese" or "same Miyagi prefecture" but even in same prefecture it's very different. Center of Sendai City is now normal but center of Shizugawa is not. Even in same Sendai City, in the center of the city and the place close to the ocean looks very different. I think the best thing we have to do is to look and see the places by your own eyes. As I live close to the place where tsunami hit, I sometimes want to write about what's going on in those places. Copyright (C) 2012 sss picture storage All Rights Reserved.. Simple theme. Theme images by gaffera. Powered by Blogger.